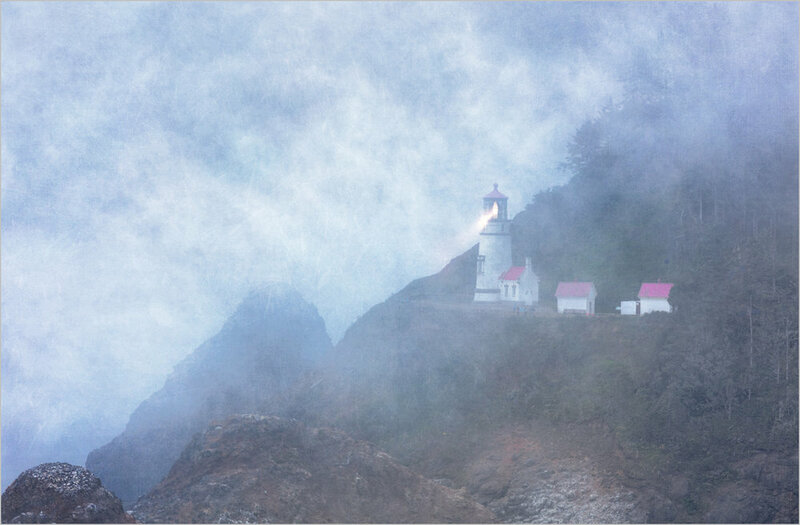 Heceta Head lighthouse, on the coast of Oregon, is one of the most photographed lighthouses in the USA. It was built in 1864 and is the 'strongest' lighthouse on the Oregon Coast in terms of light intensity, with its beam visible 24 miles away. It is also a bed and breakfast. I have previously posted a photo of the lighthouse during the 'blue hour', but here is one earlier in the day. Did I mention it can get quite foggy? Now you can see why the lighthouse might be needed! This particular image was made during the Oregon Coast workshop that Linda Torbert and I gave last August! Truth be told, the fog was so dense that in order to give some variation to the gray sky I blended a few textures into the image as well. 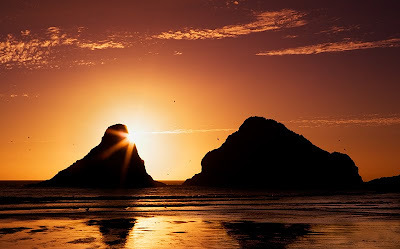 Oregon's Bandon Beach is an 'otherworldly' and surreal location that has a truly amazing array of sea stacks. Several of these rock formations have been given names related to their appearance, in much the same way as the constellations in the sky. What would you name this one? This sea stack is called 'Wizard's Hat' because of it's shape. I suppose if it were named these days its name might have some reference to Harry Potter? Callaway Gardens in Georgia is known for their azaleas. While our group went there with high hopes of arriving in peak season, we actually arrived late in terms of the peak flowering. However, there were still some very nice areas. When you are going out of town to try to photograph things directed by nature, you are always at her whim. But independent of perfect timing or not, there are still usually beautiful things to be found. I actually spotted this grouping of azaleas and trees some distance from where I was shooting and was only able to 'access it' using my 300mm lens. It is always fun to photograph great reflections, so I couldn't pass this one up. It's also a boon when the reflection is right at the roadside so very little carrying of equipment is involved. 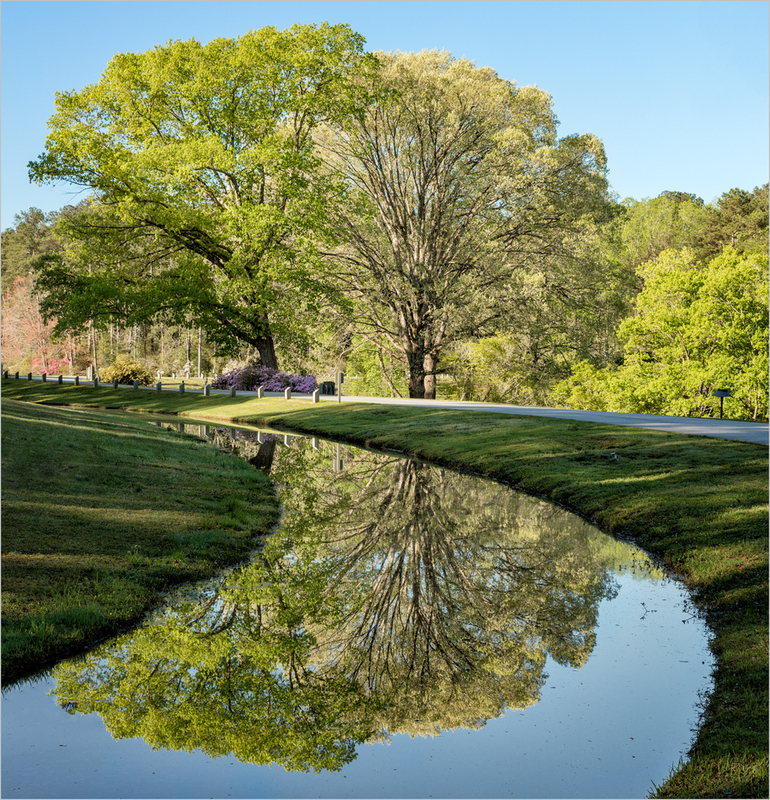 This photograph is from my recent trip to Callaway Gardens in Pine Mountain, Georgia. A few weeks ago I posted some indoor images I had made during a trip photographing with friends at Callaway Gardens in Georgia. Those particular images were made indoors because it was raining quite hard outside. But that was not the case for the entire trip. We also had some great weather conditions. 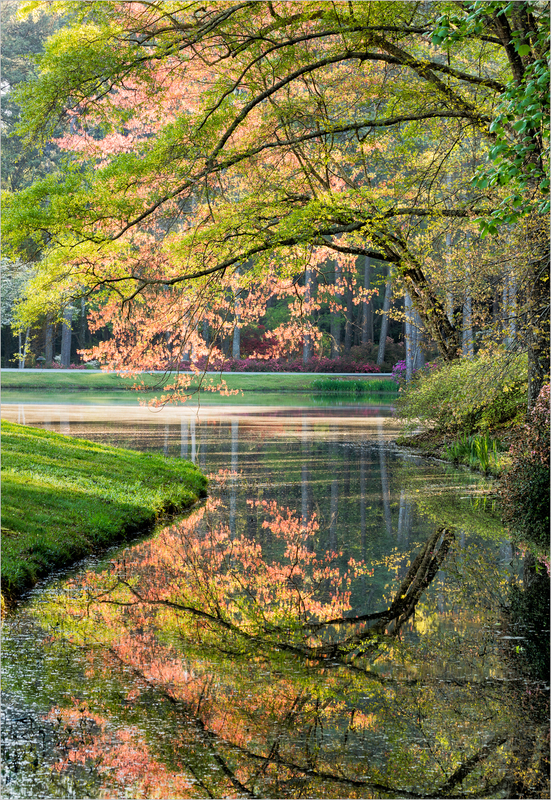 I was drawn to make this image because of the light, the pink leaves, the reflections, as well as the way the tree branches swooped gracefully. During processing, I tried to bring these features out. It was a very peaceful location indeed! Some months back I went on a terrific workshop whose focus was Death Valley, but we also made a stop in Valley Of Fire State Park in Nevada, where I had an opportunity to make some photos during an amazing sunset. Color. color. It's a sunset and it's about color. Maybe so, but I still enjoy the black and white version more. Black and white can be like that.....grabbing you when logic calls for color. For me this was one of those times. What do you think? Of course, there is no right answer! After spending the first evening of the recent Death Valley Workshop I attended photographing some remarkable architecture in Las Vegas (more of that in upcoming posts), our group made our way to Valley of Fire State Park in Nevada. We spent almost two days photographing this surreal landscape, but I do believe one could easily have spent the whole week photographing here. One thing that was quite remarkable at this location was the color of the twilight sky. It was a deep blue hue that I have not often seen. And the warm light at a low angle during sunset and sunrise seemed to make the landscape light up with a fiery orange color. Oh, maybe that's why they call it Valley of Fire! 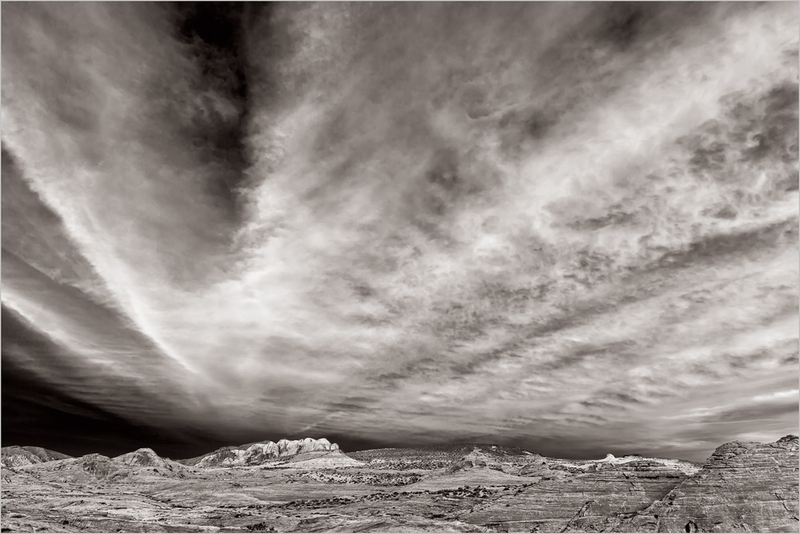 I recently returned from a workshop photographing in Nevada's Valley of Fire State Park and Death Valley in California. The workshop was run by John Barclay, Dan Sniffin, and featured black and white 'specialist' Chuck Kimmerlee. Needless to say, it was absolutely fantastic from start to finish, from the instructors and the arrangements they made, the teaching they gave, to the terrific like minded people I met. The title of this post has nothing to do with global warming or the temperature in Death Valley (though it was a VERY pleasant 70-80 degrees during the afternoons, compared to my returning to sub-zero temps here in Western Pennsylvania) and everything to do with how I start warming up to begin processing images after a workshop. Right or wrong, I generally don't jump right in the moment I get home. Instead I do all my downloading, keywording, and stacking similar images and any HDR or panorama sets together. I do this for three reasons. First, things have a way of not getting done if you don't do them....you can quote me on that. Second, I forget things. If I don't get them keyworded by location fairly soon after my return I have a tendency to forget where they were shot. Thirdly, when I come back from a trip like this I am 'hyped up' and there is a tendency to think that things are a lot better than they truly are. So I like the idea of mellowing out a bit and letting the excitement wear off so that I can approach sorting the keepers more objectively. One thing that we did, which turned out to be an incredible amount of just plain fun, was to go out right after we all arrived in Las Vegas to photograph the Lou Ruvo Center for Brain Health, a building designed by architect Frank Gehry. If you don't know that building....don't worry, I will display images of it in coming posts. It truly is an amazing structure and to me looks like something Dr,. Suess would dream up! I mentioned some posts back that I was going to try to write more about how I process my photos. To me, the type of image above is all about the lines. If they weren't straight and they didn't line up then the message is lost. Needless to say, this photo could not have been taken with the lines aligned properly in camera. First of all, this was not a composition that appeared on the first floor of the building where the camera could have been kept parallel to the market. It was something I visualized higher up, so the camera had to be tilted up which immediately throws the straight lines out of whack. I had a 90mm tilt shift lens, but that would not suffice because this photo was made at a focal length of 170mm using my 70-200mm lens. So to get the lines straight, after making some basic exposure and contrast adjustments in Lightroom, I took the image into Photoshop (yes, I know Lightroom has some straightening adjustments but it was going into PS anyway). I then duplicated the background layer and used the "Skew" command to pull and push the lines as close to pure horizontal and vertical as I could get them, using guides to help me out. 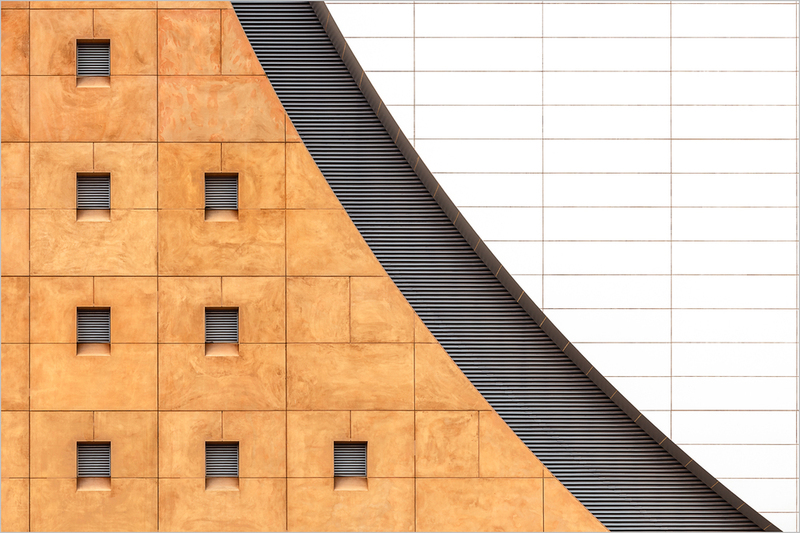 By the way, when doing capture sharpening in Lightroom I used the "Mask" slider quite heavily (it was all the way up to 40) because, again, I wanted the attention to be drawn to the lines and there really is no detail worth emphasizing on the white tiles. It was really just the edges that needed sharpening and not much was needed on the flat tiles. I also used some creative sharpening in Photoshop to further subtly enhance the horizontal and vertical lines in order to draw the eye there. Finally, I made a selection of the brown portion of the wall and a selection of the white portion and using curves and hue/saturation made adjustments to contrast and saturation as needed for both segments. Oh, and there was a special focus on black and white imagery on this workshop. So here is the black and white version. A few years back, I had the opportunity to go on a photography workshop in Provincetown, Massachusetts. One of the places we photographed was the Atwood-Higgins house. I was drawn to the texture in the wood and old peeling paint on the outside of the house. But the door was the best part. The door had the texture, the peeling paint, the color, and the great heart shaped placard on the door with the angled handle. You have to photograph what you are drawn to! There seem to be two prime times to visit the Palouse in Eastern Washington / Western Idaho. The first is around June, when the various crops are in their early stages, with patchworks of abstract greens and browns (from areas being allowed to lay fallow), and the second is in August, when the harvest occurs. 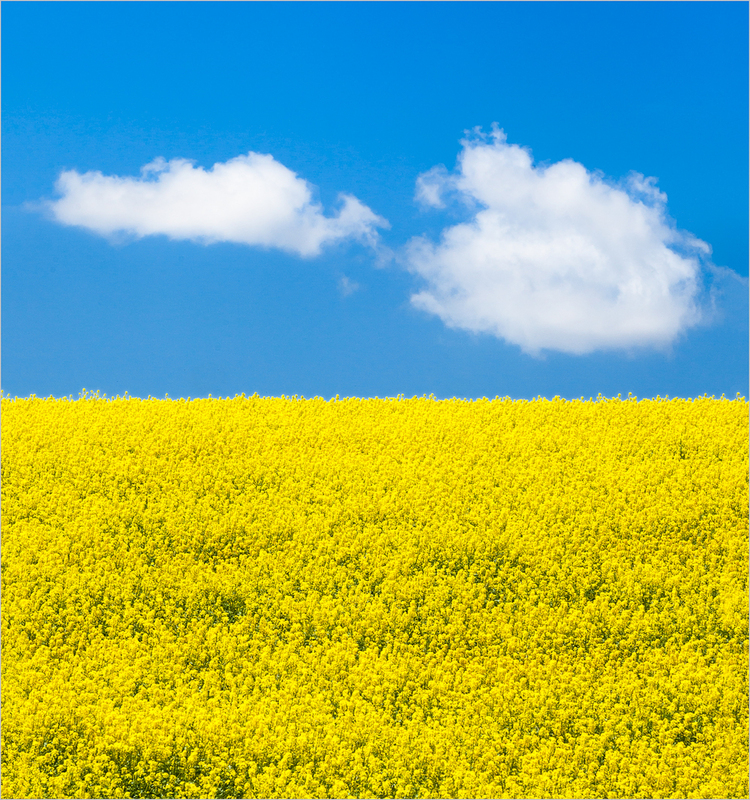 One of the bonuses of visiting in the spring is the possibility of finding bright yellow fields of canola in bloom. Why do I say 'possibility'? The first reason is that there are not all that many canola fields and the second is that the canola flowers don't bloom for very long. Well, sometimes you're lucky and sometimes you are just with the right people who know where to look (like John Barclay and Dan Sniffin). We ended up finding several fields of canola during the workshop I attended in the Palouse, of which this was one. I decided to break the usual photographic compositional rules here and allow the frame to be divided exactly in half. Sometimes it works and the rules should be broken. It seemed to work in this image, at least for me! I don't think it would have were it not for the clouds, which further subdivided the blue portion of the image. As I mentioned in my last two posts, I recently returned from a superb workshop in the Palouse region run by John Barclay and Dan Sniffin. The workshop started with a visit to a location meant to orient us to how to see and photograph what is so characteristic of the area.....rolling hills that seem to go on forever. The best way to portray them, at least in this particular area which did not have barns or grain elevators (and, yes, we visited many areas that did have both and that added another dimension to the photos), was as abstract images using a long lens. The long lens (in this case a 400 mm f5.6) was able to isolate interesting areas of the landscape while also 'compressing' the distance between the hills. As you can see from the crop, even a 400 was barely long enough on my full frame camera. So if you visit, bring the longest lens you have and/or a body with a crop factor that uses less than a full frame sensor. It has been quite a number of years since I have been to a photography workshop....but that is exactly where I have been for the last week. I just returned from an absolutely wonderful workshop in the Palouse led by John Barclay and Dan Sniffin. They truly exemplify what a well run professional workshop should be like. More specifically, they had been to the Palouse many, many times before and knew where the excellent shooting locations were. Moreover, they had a plan for every and any weather situation. And by that I don't mean just overcast vs. sunny. They had pre-arranged locations in mind for that, but also for blue skies vs. cloudy skies, chasing the changing light etc. And even though this was theoretically a photo 'tour' as opposed to a workshop, there was really no difference. They both made themselves readily available for any and all questions in the field and also had several didactic sessions that contained tidbits that would be helpful to those at all levels of processing experience. Perhaps most importantly, they were both an absolute pleasure to be around and, needless to say, are superb photographers. I certainly plan to attend more of their workshops in the future and would highly recommend them to anyone. It was both a pleasure and an honor to be photographing with them as well as with the many other very talented photographers who were participants with me in the Palouse! I hope in the next few weeks, as I go through the many images that I took, to have many to share on this blog. I just have to get through the keywording, editing, and processing stages first! Over time, I have been to many photographic workshops that I have really enjoyed. But several years ago I went one that was was the only workshop that I did not like attending. And the reason for that helped me to understand a bit about my photographic 'personality'. This particular workshop was about five or six days in duration, and during that time we photographed at Antelope Canyon, Horseshoe Bend, Monument Valley, and Canyon De Chelle. What could be bad? Well nothing really, as long as you like moving from spot to spot fairly rapidly and are OK with ending up being at some prime spots during the bright afternoons when conditions for photographing are not optimal. It made me realize that my photographic 'personality' is to move slowly and take in all the nuances of a location; to steep myself in the feel of a place and photograph it under many conditions and times. I would much rather have spent the entire week, or at least half a week, at one of those locations and gone back to multiple areas within it for sunrise and sunset and to get an opportunity to explore it more fully rather than get the classic roadside shots that have made the locations famous for being a photographer's paradise. Please understand, I am not complaining about or denigrating this particular workshop. I am just talking about how participating in it made me realize more about my personal photographic technique. Not that it's always good. I often do need someone to push me along a bit, lest I not move for hours to see what is around the bend. But it is the way I am most comfortable working. Others like to shoot and run, and that works for them. But I do think it is helpful to understand the way you work best and plan accordingly. This particular image was one where we ended up at the right place at the right time. I have generally tended to make large prints of what I consider to be my best images. But, I have come to realize that there is a problem with this method of sharing one's work. For one thing, there is always going to be a limitation in the amount of available wall space in any one location. Secondly, any image that is printed large and framed needs to be a '5 star' image in order to merit that sort of treatment and stand on it's own. 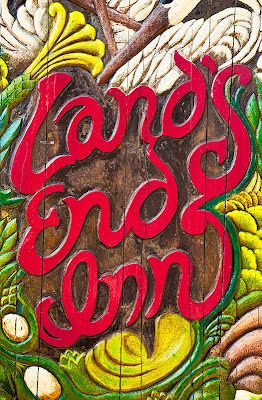 Finally, unless one is dealing with a rather large gallery space or display area where multiple large images are hanging, the image itself tends to 'live' in isolation. I have come to realize that I have many photographs that do not merit this sort of large scale, isolated display but are still one's that I think deserve to be looked at, if not in isolation than as part of a series designed to give an overview of a location or topic. Somehow, an 8 x10 or 11 x 14 image that can be hand-held and appreciated without necessarily being matted, framed, and hung seems to fit the bill and allows one to appreciate this type of artwork, which is to say high quality images that fit together but may not necessarily be part of a 'best of' collection. This image would not fare well printed as a 22x28 inch framed photo. There simply isn't enough to it to have it hanging on a wall at that size. 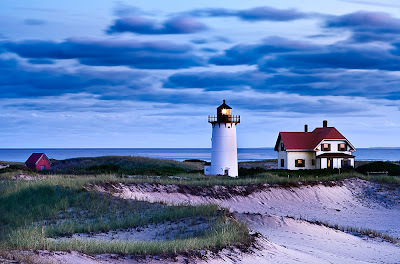 And yet it does convey a what I found to be an intriguing part of the Provincetown experience, along with the lighthouses, beaches, and sand dunes. "What is a folio? Think of it as a hybrid between an individual print and a book. 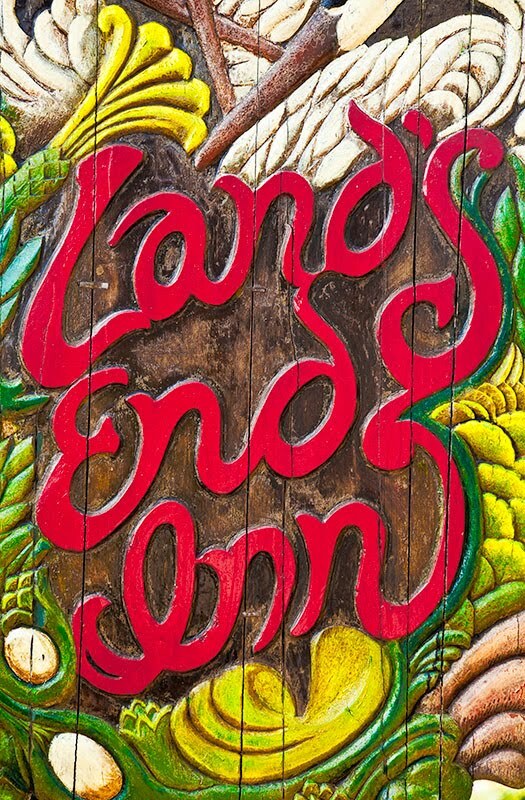 It’s a collection of unbound prints – book-size rather than wall-size prints. Because they are unbound, they can be handled individually, are meant for viewing by hand, but can be matted and framed if you choose to. The prints in a folio are presented in an embossed and die-cut art paper enclosure, and feel more like a single collection than a random pile of prints. Like a book, they are typically monographs or thematic, and contain a number of prints that explore a photographic theme more deeply than is possible with a single “greatest hits” image." I have taken an interest in the folio concept because I think it allows one to share their work in a very accessible fashion and have taken some early steps to learn how to make them. I anticipate being able to produce one at some point in the next several months. I hope this will make it easier to share a broader selection of my work with a wider audience both at home and at work. i) Motion over time - This, of course, can be revealed by photographing using a slow shutter speed. Not only can 'natural' motion be revealed in this way, but we can generate abstract images that can only be seen in the completed photograph by generating 'unnatural' motion by purposely moving the camera during exposure. ii) Color - Our brain can 'neutralize' colors in order to achieve our own 'custom white balance'. For example, people are often amazed at the blue color cast seen in photographs that are taken in the shade or the color cast that results from photographing a white object located right next to a brightly colored one. The colors are there, it's just that our brains remove them for us. Sometimes these color casts are problematic for an image and, at other times, they can be used creatively to great benefit. iii) Perspective - Changes in perspective that are related to the optics of a lens. OK, so this one really isn't something that is present in reality, but is related to the physics of the optics. Often these perspective changes can be used creatively, such as when making an object appear to be closer than it is by using a wide angle lens. These same lenses can introduce problematic distortions (like pincushion or barrel distortion). However, at times, even these types of distortions can be used creatively. iv) Illumination- Only when it is truly 'pitch black' is there not enough light to make an image if you leave the shutter open long enough. Our eyes are only able to see non-additive 'real-time' photons while film or a digital sensor can keep capturing and adding photons to an image. More specifically, bright to us is a large number of photons at once while bright to film or a sensor can mean a large number of photons absorbed over a prolonged period of time. Thus, we are surprised when a long exposure taken in near darkness yields an image with far more subtle coloration, brightness, and detail than we could see with our bare eyes. One of the reasons that I enjoy this photograph taken during a workshop in Provincetown, Massachusetts with Nancy Rotenberg, Les Saucier, and Don McGowan is that it contains all four of the above elements presented in a subtle fashion, without any of them overwhelming the other. i) the smoothing out of the ocean water because of the long 30 second exposure, blending all the waves that occurred over the course of the exposure into a smooth misty appearance. ii) the cool blue coloration of the water and sand is real and is a result of reflections from the blue night sky. We automatically neutralize this when we are present at the scene, but the photograph shows us what was really there. 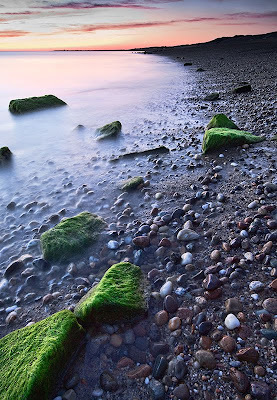 iii) the interesting perspective, making the foreground pebbles look closer and the background land look farther away than they 'really were'. iv) the scene was actually quite dark when I made this photograph, which, as I mentioned, required a 30 second exposure. It was dark enough that when hiking back to the car after making the image I had to make sure that I didn't trip over something and was glad that I was able to walk back with a friend who had a flashlight. Lots of pretty beaches up there on Cape Cod! I recently decided to work on making some prints of images I had taken while on a workshop with Nancy Rotenberg on the Oregon coast. I found that one of the 8x10 proof images I made looked interesting. At first blush I thought it was nice, but only in a very commonplace sunset shot sort of way. However, the more I looked at the image the more I began to notice interesting subtleties that made the photograph more interesting to me. I liked the flare from the sun despite the fact that I am not usually a big fan of flare effects. I liked the dark and light linear lines the waves made and I liked the subtle silhouettes of the birds flying. However, most of all (and, unfortunately, this will not be evident in the small blog image) I enjoyed the subtlety of the fact that there are hundreds of seagull silhouettes on the sea stacks themselves and that they can be seen when one looks at the rocks more carefully. They are like a hidden treat if you take the time to look. My 15 year old son likes seeing my photos, though he is far more interested in sports than in art (which, I know, is totally as expected). So I was quite surprised when, as soon as I showed him the image, he said "It's cool.....I like it. You know there is really a lot going on in this picture". I swear that's what he said! Sometimes you get the unexpected. Or maybe I don't expect as much as I should; after all, there is probably a reason I show him my photos. He does seem to have a good feel for what works. And then to top it all off I asked him if he thought that I should make the wave ripples on the right side of the picture a bit brighter. His reply was simply "Dad, I think sometimes you just over-analyze these pictures". Smart boy. I have previously written about the workshop I attended with Nancy Rotenberg, Les Saucier and Don McGowan in Provincetown, Massachusetts. This is one of my favorite images from the trip, and one with a little story behind it. A group of us took a hike out to a relatively small sand dune that had a good view of Race Point lighthouse. It was sunset and we were still relatively far from the lighthouse itself (this photo was taken with a Canon 400mm f5.6 lens). We were anxiously waiting (hoping) that the light would turn on, but it was starting to look like it was going to simply remain off for the evening. Our guide and instructor wisely decided that we should leave for the sake of safety, as it can be very hard to find one's way back among the dunes once it is dark.....they all look the same. I was the last one to pack up my equipment. Most people had started back and a buddy of mine had just scurried down the dune. I had my pack on and was just about to do the same when....the light in the lighthouse came on. My friend Ken urged me to unpack quickly and take a quick shot or two and that he would wait and keep an eye on the folks going back so we wouldn't get lost. I don't think I ever unzipped the pack so quickly. I knew exactly how I wanted to frame the shot as I had already done the visualizing work sitting there with the 400mm lens and camera on the tripod waiting for the light to turn on. I plopped it on, focused, got off a few shots and was on my way in no time. Thanks Ken! In my post about editing photographs from a trip, I mentioned that often images that are not stand alone 'best of' photos can still be important to a project because they impart to the viewer a feel for a certain area or location. This was the case for the Atwood-Higgins house, which is an early colonial homestead near Provincetown, on Cape Cod. Since I had mentioned the location, I thought I would show one of the photographs that is not all that special alone, but might well be an important contribution to a project related to the area. After workshops I have been to in the past, I have tended to process and print a few choice images that seem to stand above the others. However, I typically have known which images these will be even before returning home. This, however, has led to a bad habit. While I have typically keyworded the images from the weeklong workshops I have attended, I have not edited or rated them as a unified group in terms of overall quality. This has led to a situation where I have, from each trip, two or three 'best of' images printed while the others lie dormant and relegated to pleasant memories. It is difficult to revisit these, as they now exist as hundreds upon hundreds (or thousands upon thousands) of unedited images, making it difficult to resurrect the trip or a photo grouping that represents the workshop. Truth be told, the same situation exists with a good deal of the images I have made at home as well. I have decided to put an end to this situation. Having the photographs keyworded but unedited as a group is not a good situation for the images or for the photographer. I believe it inhibits learning and progress. Picking just one or two 'best of' images from a trip doesn't allow you to have an overview of how you photograph. To see the overall 'big picture' of how you approach photographing a location can give helpful insights into how you think about making images and, more importantly, can give direction on how to get off the path on which you are most comfortable in order to become more creative and extend beyond your own comfort zone. In addition, looking at a conglomerate of images to rate them will allow for the selection of photographs that might not be 'greatest hits' viewed in isolation, but which are important in the understanding and portrayal of a location. For example, on the workshop I just returned from, the group visited a location called the Atwood-Higgins house. This is a group of cottages that were built by some of the original settlers in the Provincetown region. They are locked (at least they were when we were there), so only exterior photographs could be taken. 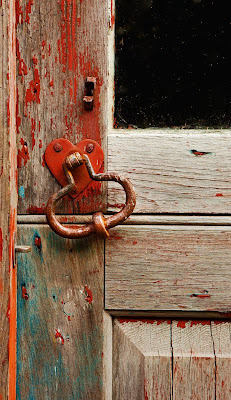 When looking for 'greatest hits' images, a photograph of an old and unusual door handle would not likely make the cut.....but it would be an image that would most certainly be in a grouping designed to transmit the feel of a visit to Cape Cod. In short, taking time to cull down hundreds and hundreds of images to perhaps twenty or thirty that truly represent the best images from a trip and which stand together as a group that relates the 'story' of a location is an exercise which I am just beginning to understand the importance of. And I think the timing is just right for me to do this for the images from the Provincetown workshop I just attended. Edit too soon and you run the risk of being overly sentimental. Wait too long and you lose the sense of place that you had experienced. I will ultimately go back (albeit quite late) and do the same for the photos from prior workshops, but tasks like this are best undertaken in small portions. If the scope is too large the work gets abandoned and never completed. So even if it delays other ideas that I wanted to pursue, I plan to give to the images I recently took the time they deserve.